I’ve tried to resist taking images of cobwebs on the basis that everybody does it. Well I managed to resist until last weekend on the “otter walk”, when I saw a cobweb within brambles and grasses that captivated me. Here was the web of a spider acting as a net in mid air to catch passing flies and other prey, while the grass upon which it was attached was doing a distinct impression of a fishing rod, bending with the strain of a catch on the end of the line. Unfortunately for this spider, all I could see on the web were rows of dewdrops. wonderful image of nature’s weaver!! Please, do not refrain from “doing what others are doing” – we all have our own vision! Great image, MM. The web is so beautifully designed. Thank you Jean, I agree on the web comment…. It’s the spider’s dream catcher! Yes I did. My sister took that a couple of weeks ago when she was visiting. We were out sightseeing on a breezy, sunshiny day! 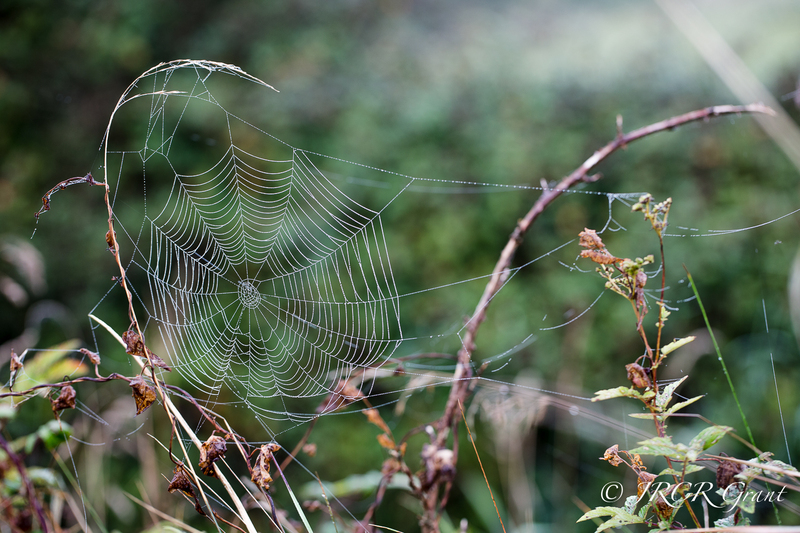 One can never, ever have enough photos of spider webs…. Not unlike the changes you have made this past year, JRCR, I’m armed with brushes and ready to take on my fear of blank watercolour paper. New photo may not be an improvement but it does instill the adage that “change is good”. So happy to “hear” that life is good on your side! Can see why this was irresistible- it is amazing both as a photo composition and as an ingenious net – I didn’t see the fishing rod connection until you mentioned it …big Wow on this one! Worth waiting for, the whole scene is very artistic.